We offer Chlorine Gas Chlorinator that is used to sterilize the water. It is the most economical and effective way of disinfecting the water that makes it safe from water borne diseases. Leveraging on the use of cutting edge technology, these are fabricated using quality raw material and are tested on certain parameters to provide good quality end product. The instrument is durable, reliable and accurate in performance. We also provide customization as required by the client. The gas chlorinators provided by us are used in water purification processes. 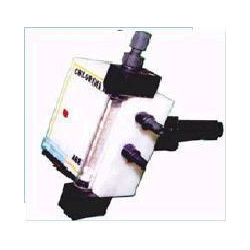 The safe and space saving chlorinator is consists of flow control valve, yoke clamp, vacuum regulator and rotameter. The water passes under pressure through an injector generates vacuum, that opens the check valve. If there any break occurs in the vacuum line, the system automatically shut off the chlorine supply. The installation offerings that come along with the chlorinator includes pvc tubing for vacuum supply, moisture trap for chlorine gas, copper tubing, chlorine test kit, non return valve and strainer. These reliable and durable gas chlorinators finds application in sewage treatment plants, cooling water systems, water filtration plants and industrial effluent treatment plants. These are also customized as per the requirements of the client. Looking for Chlorine Gas Chlorinators ?